A fourth loss of the season for the western province, but they delivered their best performance to secure a try-scoring bonus point. CONNACHT CAME MIGHTILY lose to causing the Guinness PRO14 upset of the season, but ultimately fell short going down 36-27 to defending champions Scarlets. However, Kieran Keane’s side left West Wales with credit in the bank as they scored four tries through Jack Carty, Cian Kelleher and Tiernan O’Halloran’s brace. Despite their fourth defeat of the season, this was Connacht’s best performance of the campaign to date, with the Irish province rediscovering some of the attacking verve that made them champions in 2016. But Scarlets just had too much for them, scoring five tries through Johnny McNicholl, Steffan Evans, Rhys Patchell, Leigh Halfpenny and Leinster native Tadhg Beirne. The Scarlets started the stronger of the two sides with winger McNicholl touching down under the posts after a powerful break by centre Jonathan Davies. 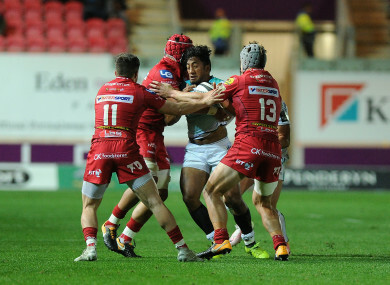 Just when it looked like the Scarlets were going to have it all their own way, Bundee Aki forced his opposite number Scott Williams to throw a loose pass in his own 22 which was gathered by out-half Carty who scored Connacht’s first try. The home side hit straight back when electric winger Evans beat three Connacht defenders with his footwork to scorch over from 40 metres. Evans was at the forefront of the Welsh region’s third try with a sumptuous offload for out-half Patchell to cross. But Keane’s side refused to lie down, hitting back with two cracking tries of their own to briefly take the lead. The visitors’ second was scored by O’Halloran and his wing partner Kelleher then scored in the opposite corner. Still the scoring wouldn’t end as Halfpenny showed his attacking prowess, connecting well with Davies and Evans to put the Scarlets ahead at half time. In what was an enthralling second 40, Connacht pushed Scarlets to the wire and came close to levelling the scores with four minutes to go after No 8 Eoin McKeon set up O’Halloran. Carty’s conversion would have tied the scores, but his kick went wide and that was as good as it got for the visitors as Beirne powered over from short range to secure a bonus point victory for the champions. Email “Connacht give champions a scare, but lose 9-try shootout with Scarlets”. Feedback on “Connacht give champions a scare, but lose 9-try shootout with Scarlets”.